Chloe Chek is a 3 years old girl diagnosed with Spinal Muscular Atrophy. The disease affected her overall muscles, especially her lower limb and she is facing challenges to stand or walk. She is currently moving around on a wheelchair, accompanied by her favorite doll…. In order to maintain her skeletal muscle’s strength, Chloe has to practice rolling and standing everyday. 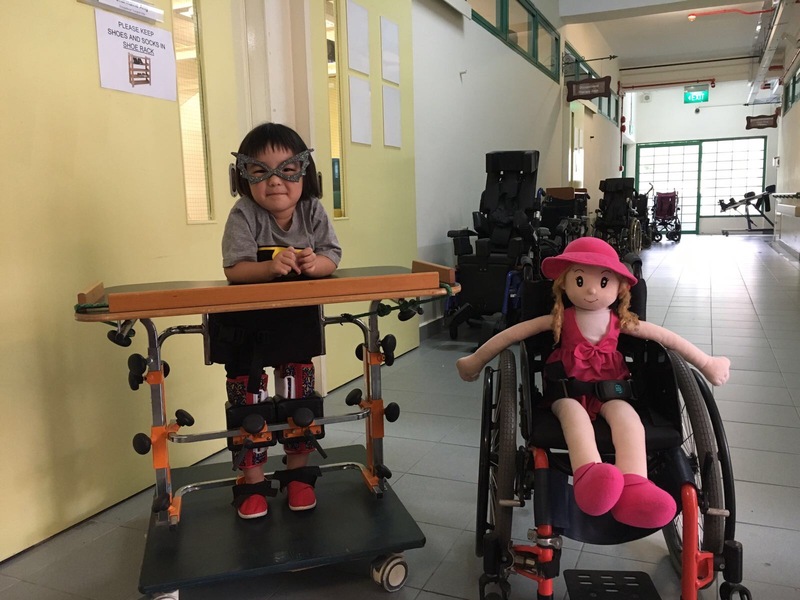 Chloe is a very hardworking girl and she practices standing on a stander in school every day. The therapist in her school, Rainbow Centre, recommended she should have a stander at home too. Chloe shared with her mother that if she work hard now and when she grows older, she would be able to walk and run like her elder sister. As a SMA child, we know her dream might not come true unless an expensive treatment (est. US$750,000 for first year and US$325,00 for the rest of her life) could be given to her. Before she could access to treatment, the family has to work hard to keep her muscles strong and prevent further muscles loss. “I am at lost of words on how to explain to her that she might not be able to walk for the rest all her life. This is the least that I can do (in getting the stander) now to keep her dream alive” said Chloe’s mother, Dannie. The stander that Chloe needs cost around $2,600.00 and we are hoping to raise up to $2,000 for the family. We hope this stander will be the best Christmas gift for Chloe this year. Make this Christmas meaningful by donating to Chloe to make her wish comes true. She hoped to stand and eventually walk one day.